On June 30,2012 Muhammad Morsi became the first freely elected leader in Egypt’s six-thousand year history. Nine months later, a circle of five Egyptian friends began circulating a petition calling for him to resign. 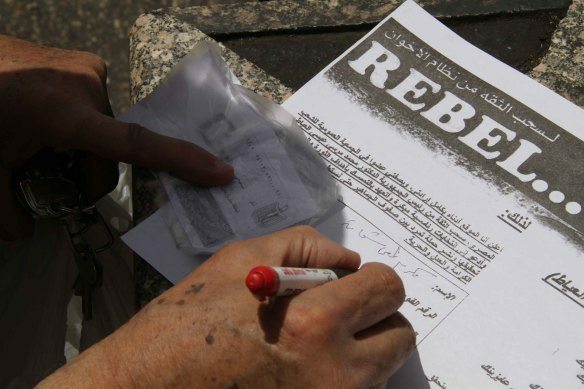 Three months later, by the first anniversary of his inauguration, June 30, 2013, the social-media driven new movement, dubbed the “Tamarod” (meaning rebel), had gathered 22 million signatures. And for the next three days, Egypt’s independent media estimated the crowds that came out to demand Morsi’s resignation numbered as high as 14 million or roughly 1 in 5 Egyptians. Just as they had done in bringing about the fall of Mubarak two years earlier, on July 3rd the Egyptian armed forces, under General al Sisi, stepped into the breach, deposed Morsi and placed him and the Egyptian leadership of the Muslim Brotherhood under house arrest. 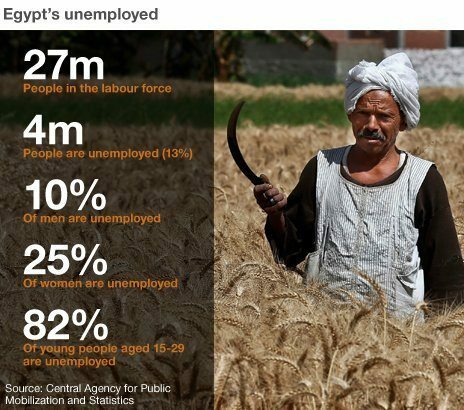 How is Egypt Nearly Ungovernable? Even in the best of times, Egypt is nearly ungovernable because it is so polarized. Approximately 30 to 40% of Egyptians are secularists who would like to drag the country more thoroughly into modernity and be governed by a pluralistic western-styled democratic system. Most of this group is well-educated and has private-sector business interests. Another 30 to 40% are mostly less educated and want to return Egypt to its more pure Muslim roots and, as the Muslim Brotherhood advocates, be governed by an Egyptian version of sharia law. Most of them are Morsi supporters and are now marching in the streets of Cairo. Another faction within this faction is the al Nour tribe who are Salafists (radical Islamists who wish to wage violent jihad against Israel and the West). Another 10% are the highly persecuted Coptic Christians and Shia Muslims. Add to this the fact that 40% of the country are desperately poor and live on about $2 a day while the educated middle class expect the government to provide subsidies for virtually everything from bread to fuel, staples they can’t afford on the low salaries they receive from the lifetime public sector jobs which they expect the government to provide them once they’ve graduated from college. Still another faction is the 450,000 man armed forces who comprise a cadre of Egypt’s elite but who surprisingly enjoy 94% approval rating in a recent poll. They are seen as the one Egyptian institution that is honest and competent and therefore is entrusted to be the impartial arbiter of popular will. Paradoxically, the military along with tens of thousands of its retired officers enjoy a privileged control of state and private businesses from oil production to the operation of the Suez Canal. And of course, with this month’s coup, U.S. aid is once again controlled by the military. To say that these factions have unsustainable, warring interests would be a gross understatement. Jumping into this toxic brew was the newly elected, hapless Morsi/Brotherhood administration. They proved that playing the victim of persecution has nothing to do with attempting to govern an arguably ungovernable country. After just nine months in power, had the Morsi government not received a $48 billion bailout from Qatar and Egypt, the country would have gone bankrupt and been plunged into chaos. Morsi’s removal from office, after just one year in power, must be a record in the annals of governmental malfeasance. Once Egypt has blown through the $48 billion, it’s doubtful that anyone else will want to re-up. Might Phase One of the American Revolution 2.0 Follow the Egyptian Model? Rational observers of the Middle East would have preferred Egypt, the most populous Arab country, to have made its transition to democracy more smoothly, without mob rule. And it is worrisome to note that other countries, Tunisia, Turkey, and even Brazil are beginning to mimic the Egyptian model where, instead of the electoral process, huge mobs in the street drive regime change. Almost no one will benefit from the chaos in Egypt or the greater in the Middle East. Yet it’s not difficult to imagine how regime change loosely following the Egyptian model might occur in the U.S. and in the near term. Consider that a microcosm of it has already played out in the U.S. Several years ago, an investigative reporter published a story about the mayor, city manager, and a few cronies running a small burg, Bell, of Southern California. The story exposed the fact that they were paying themselves high, six-figure salaries with sumptuous benefits while the city fell into Detroit-like decline. Learning of this, the mostly Spanish-speaking citizens of the pot hole-ridden town stormed the city hall shouting, “Fuera!” (Out!) And it worked. The mayor and his cronies resigned and were summarily run out of town. Moreover, we can imagine that with the coming implementation of his healthcare act, Obama’s ability to distance himself from the devastating effects of his policies will come to an end. The veil over the eyes of the young Obama voters (24 to 34 year olds) will be lifted. They will feel conned and angry. And because they can’t find gainful employment but are still forced to buy a healthcare policy that they don’t want and can’t afford, this will be the unveiling. 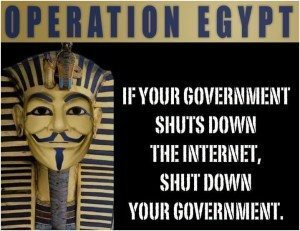 As in Egypt, they will respond by the millions to the Twitter- and Facebook-driven call to come to Washington and shut the government down. The goal will not be to make their presence felt but, like the Egyptians, to stay and disrupt the nation’s capital until Obama and Biden, Reid and Boehner are forced to resign. 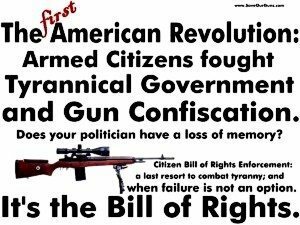 Gun rights activists alone could spawn millions of 2.0 revolutionaries. Photo source: http://goo.gl/1C7UYZ. Young underemployed college graduates, working only 29 hours a week at places like Wal-Mart, infuriated at being mandated to buy government-sanctioned healthcare. Young Doctors who’ve stopped practicing medicine because they can’t charge enough to pay off their college loans. Young veterans, many of whom lost friends in Iraq and in Afghanistan and are mad as hell at this President for squandering all that they sacrificed. Social Media addicts and fans who are pissed off that their government is collecting and snooping into their communications. Tea Party members who hold the Obama Administration accountable for targeting conservative groups, appalled by his multiple violations of his constitutional authority and oath of office. Coal Miners put out of work by Obama’s war on coal. Pipeline workers unable to apply for work for the Keystone Pipeline. Out of work union and non-union construction workers who’ve been replaced by lower-cost illegal aliens. SEIU and other public and private-sector union members who see Obamacare as a “give back” from the gold-plated health plans they formerly had before the passage of the law. Misfits and anarchists who like “f___ing with the one-per-centers” and who join the march as a means to have a good time trashing D.C.
How Might the US Military Follow the Egyptian Model? On TV and various other media, the world would witness scenes in D.C. like those in Cairo where millions of protestors fill the streets surrounding the White House and Congress carrying signs and shouting, “Obama, Biden, Go Home! Reid, Boehner, Go Home!” And while the everyday business of D.C, law making, back-room deal making, and lobbying grinds to halt, we can easily imagine our enemies in Tehran and their allies are so emboldened that they not only “cross the red line,” but make preparations to threaten the American heartland. Amid the chaos swirling around him and while watching the wreck of his presidency, it is not difficult to imagine that when this president is briefed about an impending new Cuban Missile Crisis, he fails to act. “We would like to announce to the nation, to the protestors in our Capital, and our allies around the world, that the Obama family is in a safe, comfortable compound. They will not be receiving or making phone calls until new elections have been concluded but their children are with them. In short, the U.S. military will attend to their every need until new elections are held and a constitutional government restored. This is part 2 of a 3 part series. View Part 1 Here.